OTech: Storing documents in a PACS or RIS: bad idea. Managing documents is not a new issue as document management systems have been in place long before and in parallel with PACS, department information systems such as RIS and LIS or CIS, or Electronic Health Record systems. However, while departmental systems were being installed, many departments have been scanning in documents into their respective systems to make them available to physicians. With regard to documents, there are two categories, the first are medical record documentation which are essential for a physician to be able to do his or her clinical job, and the second are legal and regulatory documentation that are kept “just-in-case.” Examples of medical records include the sheet that conveys the clinical measurements done by a technologist when performing an ultrasound procedure, a requisition form that shows the reason for the study, or a diagnostic report from a previous study. The second category includes consents forms, HIPAA privacy release forms, and others. The staff members charged with scanning in these forms range from the “front-desk” medical receptionist to specialists such as medical records technologists. The latter are usually found in larger institutions that have a document scanner next to the CT or MR operator’s console. How is this implemented? Let’s take radiology for example. For users who have PACS driven systems, these documents typically are encapsulated with a DICOM header and the capture station or software typically has access to the order so that the header can be populated with the same patient and study information. The formats are mostly the so-called “secondary capture” format, which can be thought of as a bitmap or screenshot. There is also an option to scan the document as a DICOM encapsulated PDF, which is used less, but has the advantage of being much more efficient, resulting in smaller file sizes. The disadvantage of the encapsulated PDF solution is that there could be PACS compatibility issues as not every workstation has the capability of viewing them. These PACS driven solutions make the documents available as part of the same study where the images reside, typically in a separate series and they are stored in the PACS archive. For users who have departmental driven systems, where the worklist for the physician is created by a RIS or CIS, there is typically access to the department database and therefore the documents are scanned into the information system as files, which can be in JPEG, PDF or other formats such as TIFF. These are indexed and managed by the departmental information system database. 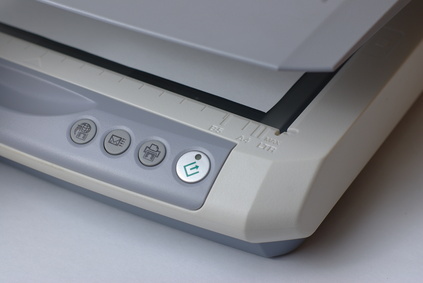 Dedicated document management systems do have their own databases and archives, and are often more sophisticated as they employ high speed scanners as well as sophisticated software performing Optical Character Recognition (OCR) to recognize patient demographics, which can be used to index the documents. Several institutions have worked on becoming totally “paperless,” and have established dedicated departments for scanning in all of patient documentation. See related blog on certification of document administrators on this topic. The problem with all of these solutions is that they create “islands” of patient documentation and are application and/or department centric instead of patient centric. Two major developments, however, are driving a more patient centric approach. The first one is the meaningful use requirement for electronic health records implementation. The second development that has been going on in parallel with meaningful use is the trend towards a true enterprise or Vendor Neutral Archiving solution (VNA). A “true” VNA should provide storage, management and access to these documents. So the best answer on where to store documents, i.e. either in the RIS, in other department systems or in the PACS is “neither one,” as these are both short-term, dead-end solutions. Rather, investigate how your electronic health record solution manages documentation and how your enterprise archiving system stores and retrieves them. That is the only way to provide a long-term, patient centric solution. As a professional with proper cissp training, you don't store documents and valuable information in this kind of media. Many of us mistreat information, they are an asset to any company or anyone so before storing your information, plan first on where to put it. I'm surprised that there's been little progress with digital scanning services as far as the medical sector is concerned. Still, that development on VNA seems like a plan with a lot of potential. I think budget plays a very big role in using pacs and RIS. They should learn itil demand management, to forecast what suitable for their budget. Personal records and information are important so storing them must be a top priority for department databases. I agree that dedicated DMS are more sophisticated that is why I prefer those type of systems for 3d scanning services.All types of business should start processing paperless documents in order to run the business faster and easier. Knowing the right configuration of this machine and proper usage is an important thing to learn. This is to prevent any damage to the machine. Have to ever tried to find a perfect document capture solution, and get rid of the worries of losing the sensitive data and information. The statement of purpose examples are available here. It provide you different skills, and, if the system is of a sufficiently large scale, different people having different data. You might be asking how you can keep away from this, or whether a payday advance is ever justified regardless of the hazard.